Hi. So my passenger side window starts to angle a bit & won't close completely unless I grab the top of the window & pull twards the rear of the car while rolling up? It seems to work fine when it's raining outside. Any ideas would be much appreciated! I have this same problem with my drivers side. I've taken the side off but can't really make sense of it because of the door inner panels and sheet metal being in the way. 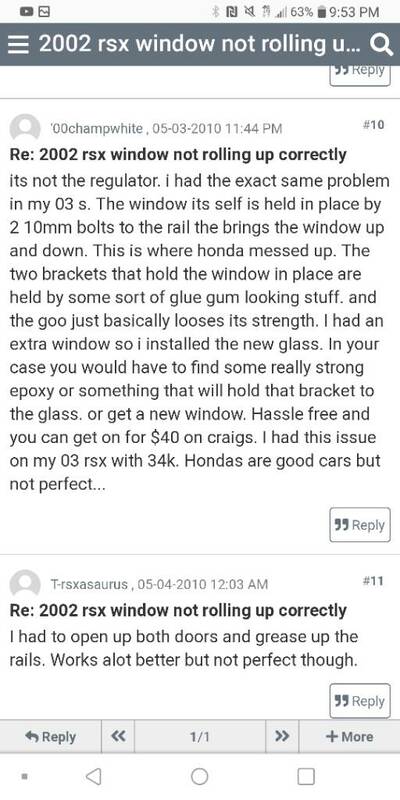 I read some people have to replace the entire window and motor assembly because of a broken piece though... :\ But not sure if that's MY problem or not. Yeah I think I read that somewhere as well. Like a broken tab or somthing? I also remember someone had a way of fixing it without replacing things. It seems like greasing somthing up might work as it works when wet. *Hopefully someone chimes in. Yeah, not sure if that's what's wrong with mine or not. I have had some luck cleaning the side channels where it slides and lubricating everything, but it's only lasted for a few days at most if that. 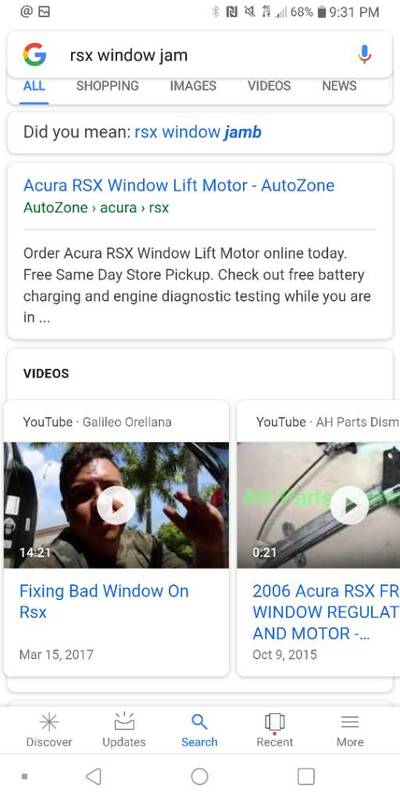 Also if you don't hold the window, or someone else doesn't know about it (like if you have a shop work on the car) they will have to remove the entire door panel to get the glass back on it's track. So make sure you're always vigil about it and also leave a sticky note on the gauges/wheel so people don't roll it down or roll it up if it's already down. Ok, I think these shed some light! Watch the youtube & then read the forum page. Yeah, I tried greasing up the rails but it didn't really help much. I'll try it again when it gets warmer out, I think I've only tried it with wd40. I think at least with mine is it needs to be epoxyed at the corner base of the window. It was mentioned in the thread & the guy in the video did a poor job at it using JB Weld. Definitely update with some pics and what kind of epoxy you're using.